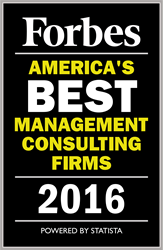 Forbes has named Strategic Decisions Group to its list of America’s Best Management Consulting Firms. The list is based on ratings of more than 250 firms in 15 industries and 16 functional areas. We are particularly pleased to become part of the Forbes list as it is is based on recommendations by both clients we have worked with in the past four years and consulting peers. Strategic Decisions Group is one of America’s Best Management Consulting Firms, according to Forbes. The list is based on ratings of more than 250 firms in 15 industries and 16 functional areas, such as strategy, HR consulting, and supply chain management.